During the seventeenth and eighteenth centuries an increasing number of tithe transactions were arranged by ‘modus decimandi.’ This substituted monetary payments for tithe in kind and 'established modes of valuing tithe, in some places by the acre, in others by the quantity of produce'. (A Layman of the Church of England, Address to the Protestant clergy of Ireland, Dublin 1787). In 1751 in the parishes of Ardstraw, Urney and Camus fixed sums for tithe payments included 9d for a milch cow, 1d for a sheep 1d, 1d for a garden and 6d for a turf stack. In accepting this system, the clergyman had to satisfy himself with less than the tenth to which he was legally entitled, as a due allowance had to be made for the harvest and collection of the tithe crops, a service which was not legally the onus of the parishioner. For many tithe owners, resulting disagreements and difficulties with parishioners forced the sale of their tithe to a middle-man known as a tithe farmer or a tithe-proctor. The proctor would generally be a substantial farmer familiar with the tithe system and had an intimate knowledge of the local people and parish. It was the tithe proctor who initially evaluated and ultimately collected tithe for the beneficial clergyman or tithe-owner. The clergyman received a fixed sum and the excess was retained by the proctor who was therefore motivated to exact every last penny. Inevitably the proctor was unpopular in local areas and particularly when he arrived to conduct the contentious annual valuation. The tithe proctor was the most visible agent of the tithe system. The proctor appeared in early summer to view the crops and estimate the likely yield. Just before the harvest he returned to bargain with the grower. Disputes between tithe proctors and tithe-payers were referred to the owner of the tithe for adjudication. The Tithe composition act (1823) legislated for the extinction of the tithe-proctor. The imposition of the tithe is considered by historians to be an important catalyst for both agrarian unrest and emigration at various times in the eighteenth century. In 1718 Edmund Kaine, agent on the Barrett Lennard estate, noted that ‘one hundred families had passed through his town in the past week heading for New England’, adding that those departing ‘complain most the hardship of the tithes makes them all go, which is true, for the clergy is unreasonable’ (MIC170/2). In addition to the annual tithe burden farmers had to pay rent county-cess (rates) and hearth money adding further to the financial stress. Tithe lists are rare before the nineteenth century. 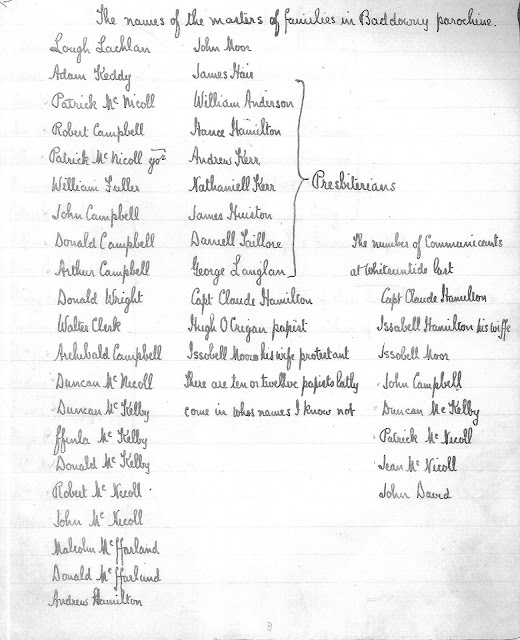 One useful source uncovered in PRONI (T542) contains a list of tithe payers in three parishes in Co Tyrone in 1699. The origin of the source is the archive of Archbishop King (now in Trinity College, Dublin) referenced in the Genealogical Office GO MS536. The source is described as ‘Morgan’s account of the parishes of Drumragh, Cappagh and Badoney, Co Tyrone’. 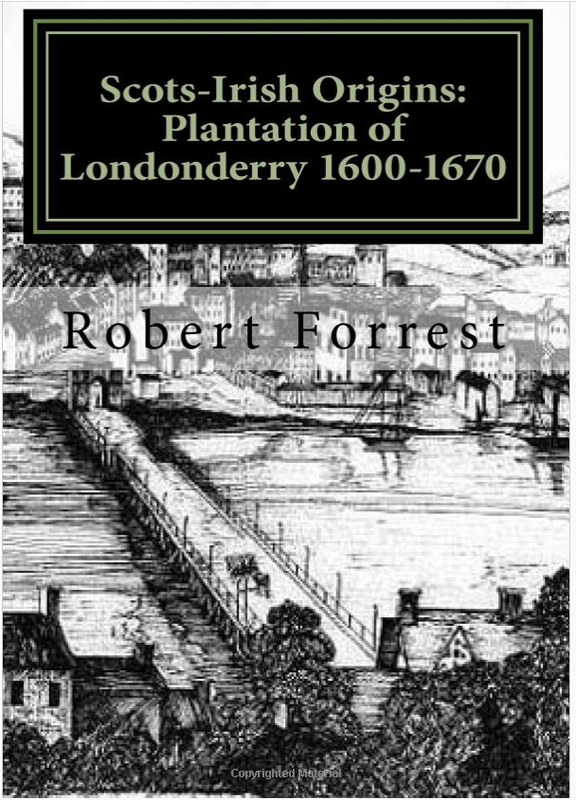 It was written at Omagh by the Reverend Robert Morgan on the 22nd June 1699 and addressed to the Rt. Rev William (King), Bishop of Derry. The correspondence consists of five pages (the first page being a cover sheet). In obedience to your command I have sent here enclosed the names of the masters of ffamilies of those parochies wherein I am concerned, generally they are poor, as their particulare returnes will make evident, which how soon they come to my hands your Lo(rdship) may have or a true copy upon desires for relying upon your Lo(rd’s) favour and words, for the continuance of the Sequestration to me as formerly, I have ordered all of them to be viewed and intend to set them tithes, unless you otherwise command, and if so, I shall be in duty obleiged obey. The 1699 tithes-list is a most useful genealogical source although limited to only three parishes. 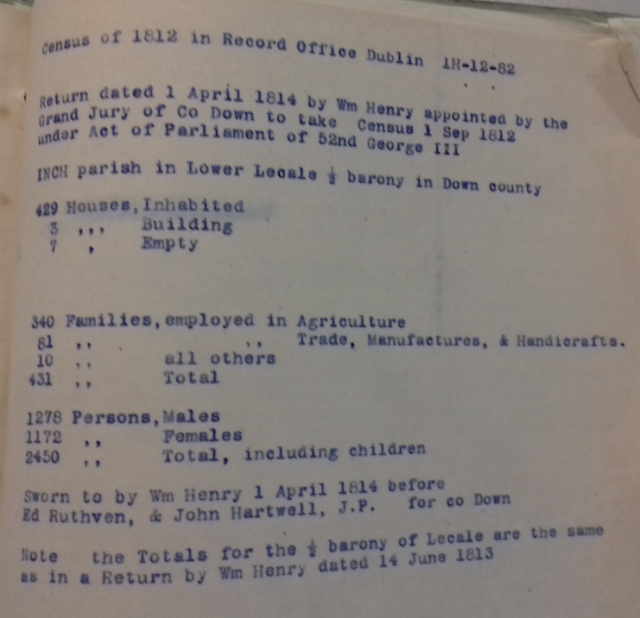 Containing the names of some 130 heads of households this is effectively a list of strong farmers in these parishes at the end of the seventeenth century and opens pathways for further research into the named individuals through land records such as estate papers and the registry of deeds. It is also a useful source for tracing surnames in these parishes. The absence of Catholic families in the list perhaps reflects the aftermath of the Williamite land redistribution and the imposition of penal laws that precluded Catholics from holding long leases. 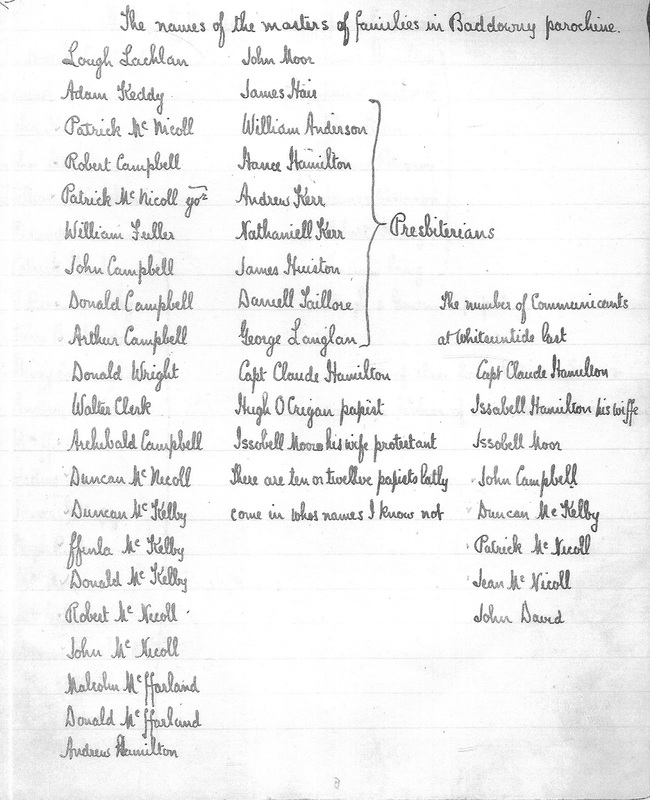 The lists provide a useful means of identifying protestant heads of households in three contiguous parishes in Co. Tyrone some nineteen years before the first significant wave of Scots-Irish migration to the New England in 1718. Excellent blog. In my 1718 Project, I have ignored the "outlier " counties for my emigrant residence pre-1718. It looks like I need to focus on Tyrone and Monaghan a little more for families. Do we know the residence of Edward Keane? That could be a significant clue to the emigrants locations in Ireland. Thanks Colin - the info on Edward Kaine comes from William Roulston's brilliant book 'Tracing Scots-Irish ancestors'. 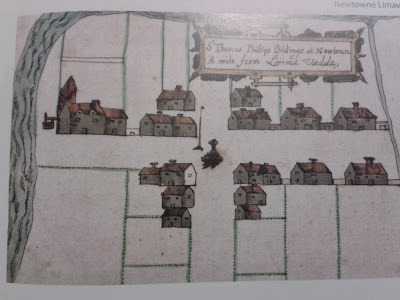 In 1715 Edmund Kaine, agent on the Barrett Lennard estate at Clones, County Monaghan, recommended to his employer, Dacre Barrett, that the local Presbyterian congregation should be given a secure lease for a plot of ground on which they were intending to build a new meeting house. Kaine’s argument was that the construction of the meeting house would ‘destroy the Irish and plant your estate with Protestants ... it will be a good workhouse’.